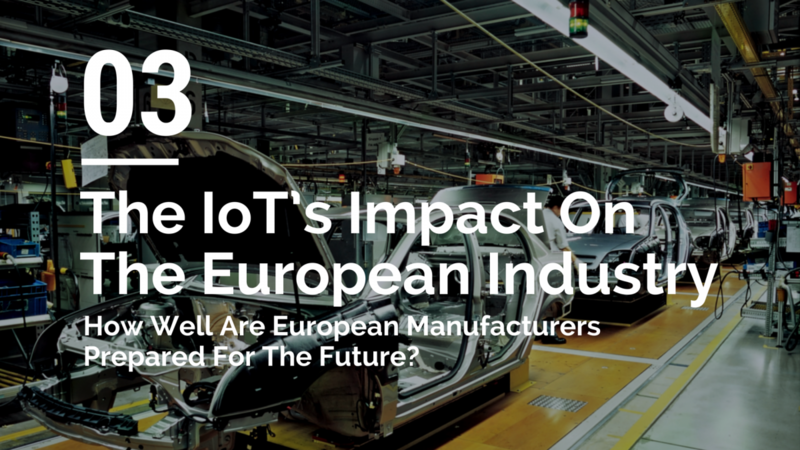 How Well Are European Manufacturers Prepared For The Future? 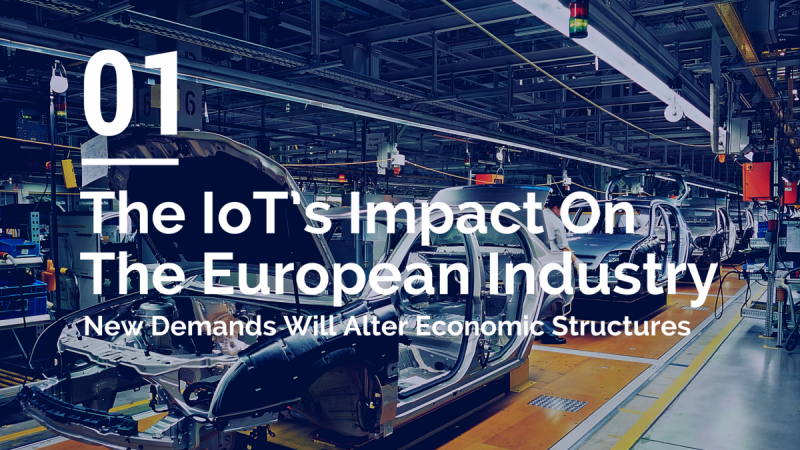 As established in the first two blogs of this series (read part I here and part II here) the IoT will create a new business model in which consumers will demand highly individualised products. This will require a shift from producing high volumes at low prices to manufacturing individual goods as cost efficient as possible. Thus in the future Industry 4.0 strategies will need to help companies to optimise classic production, implement new flexible manufacturing models and tackle human resources and data security challenges. 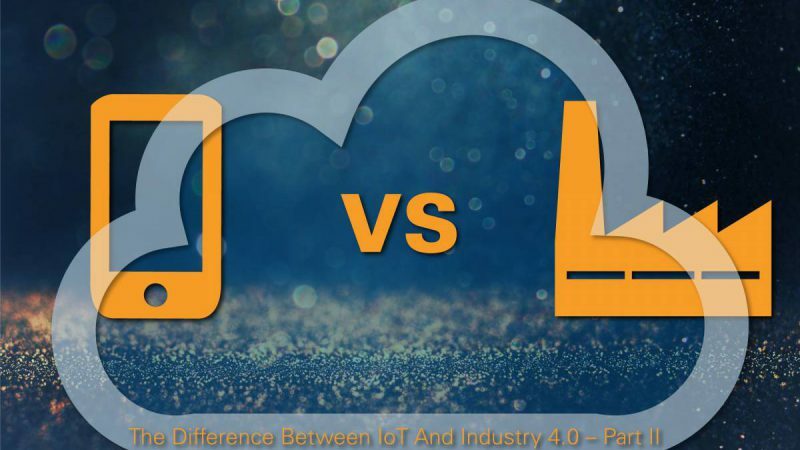 Industry 4.0 & Advanced Technologies – How Does Europe Compare? To answer this question we need to look at some basic facts first. 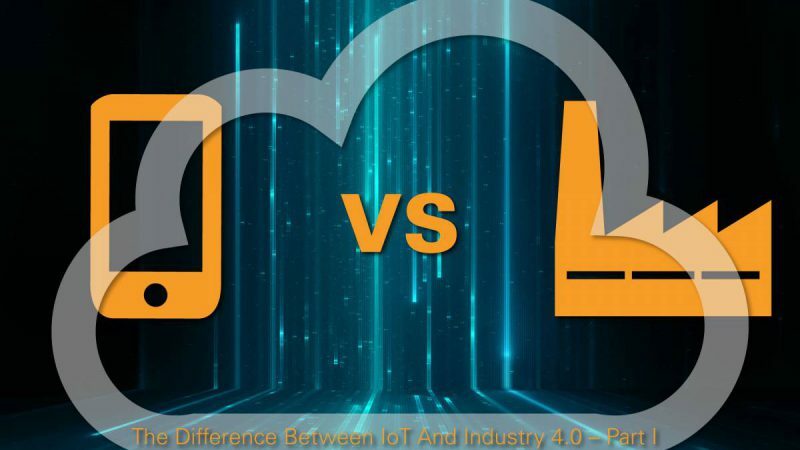 According to a survey conducted by the the Boston Consulting Group (BCG), comparing the adoption of industrial IoT in the US and Germany, the pace of Industry 4.0 implementation is similar in both countries (editor’s note: 600 managers and executives from 312 German and 315 US companies were questioned in order to get the results). 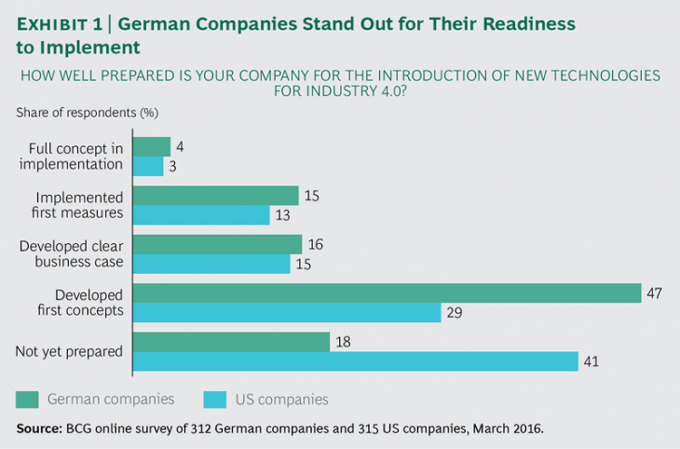 The report further concludes that German companies appear to be better prepared to adopt Industry 4.0 (see graphic below). For manufacturers it is important to implement advanced technologies to create more flexibility. According to the survey German companies show stronger ambitions to implement and apply technologies like autonomous robots than US ones. In the European country 60% of companies questioned already have or at least plan to apply new technologies. On the other side of the Atlantic roughly 40% of companies can say the same (see graphic below). 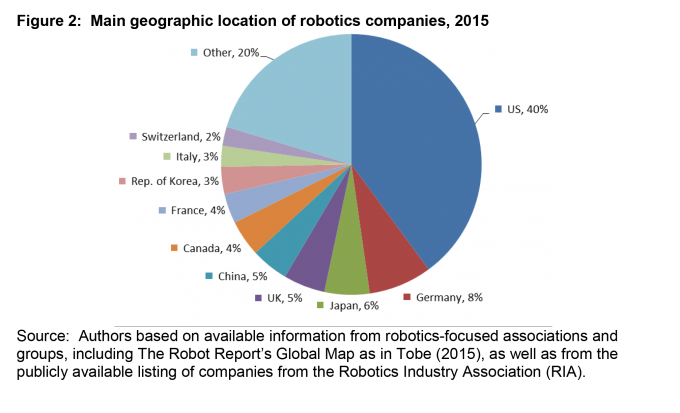 The World Intellectual Property Organization (WIPO) claims in the Economic Research Working Paper No.30 “Breakthrough technologies – Robotics, innovation and intellectual property” that robotics cluster are mainly located in the US and Europe (see graphic below). 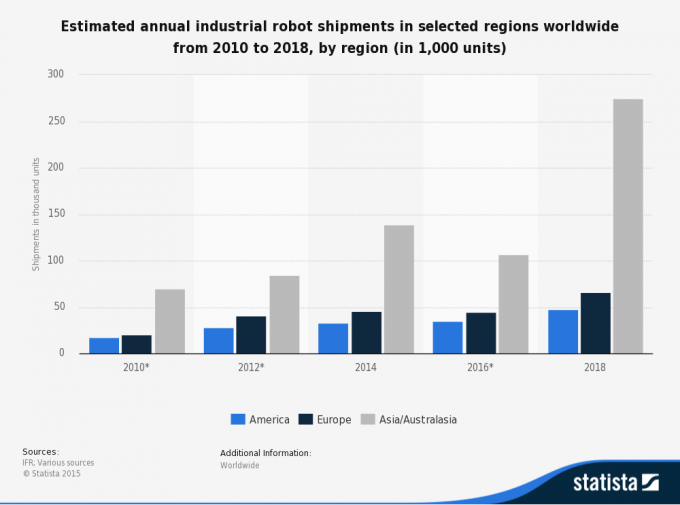 Despite those optimistic statistics the predicted numbers for annual industrial robot shipments speak another language. China will soon show Europe and the US the taillights (see graphic below). In addition Asian regions are catching up with European industries as most patents in the area of robotics are filed in Japan, China, Republic of Korea and the US. Furthermore those regions are on the edge of overtaking Europe in the fields of AI and 3D printing. Companies like Google and Tesla in the US are taking huge risks to test and develop new AI solutions (tragically in case of Tesla’s autonomous driving feature this even did cost a life recently). Meanwhile Harry Shum, executive vice-president of technology and research at Microsoft believes that China will “lead the world” in producing artificially intelligent hardware. 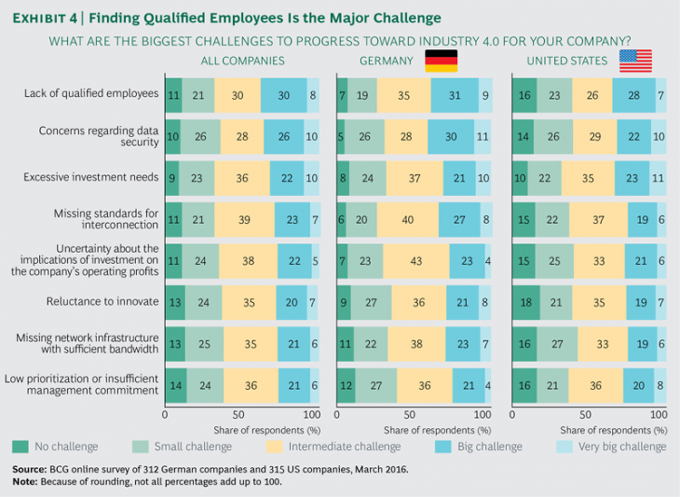 Regarding the implementation of new, required know-how and access to skilled labour the survey of the BCG shows that US companies are willing to use more aggressive recruiting strategies than German ones. As fundamental new skills are required from the workforce there will be job losses in some areas (such as manufacturing and maintenance) and gains in others (such as IT; see graphic below). 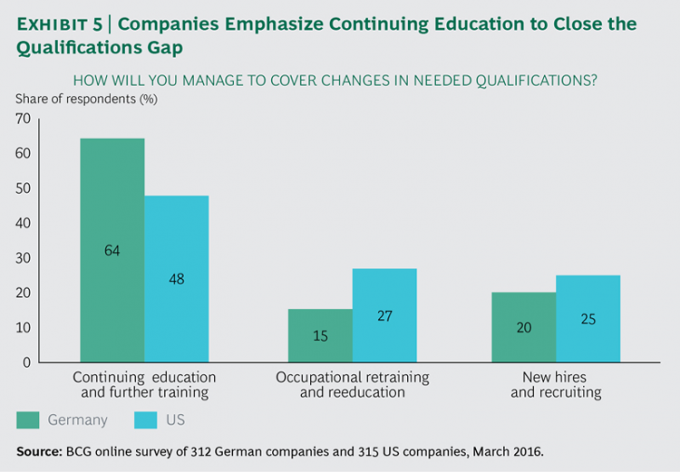 US companies are ready to hire new potential while German companies are focusing on education and training of existing employees. There is a similar picture if we look at the survey results regarding data security. Privacy seems to be a bigger concern for German companies than for their US pendants (see graphic below). Let’s put the statistics from above into context. No doubt Europe and especially Germany is able to upgrade classic production lines with Industry 4.0 technology. 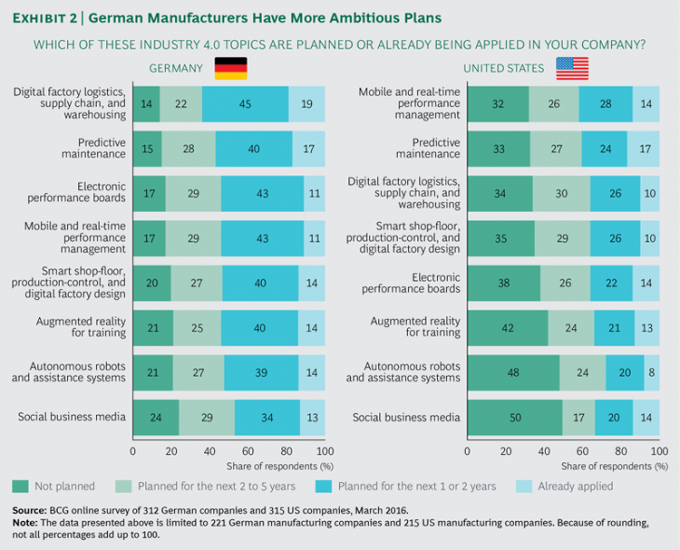 However the optimistic results from the BCG regarding the already advanced adoption of industrial IoT into manufacturing in Germany are not reflecting all layers of the economy. The numbers might be true for big players like Bosch and German car makers but not quite for small and medium sized enterprises (SMEs). The so called “Mittelstand” is falling behind and is not yet taking the necessary risks in order to develop and execute globally competitive digitalisation strategies. In order to solve this issue SMEs need to think beyond European borders and be open to new partnerships and investments. Furthermore they will need support from high-tech companies like EBV in order to define their industrial IoT strategies and get access to advanced hardware as well as to extensive partner networks. Regarding new business models the situation is somewhat worse for Europe. In order to deliver custom goods data is trump. Even in the manufacturing business data will become more valuable than quality. The graphic from The Economist below reflects this perfectly. 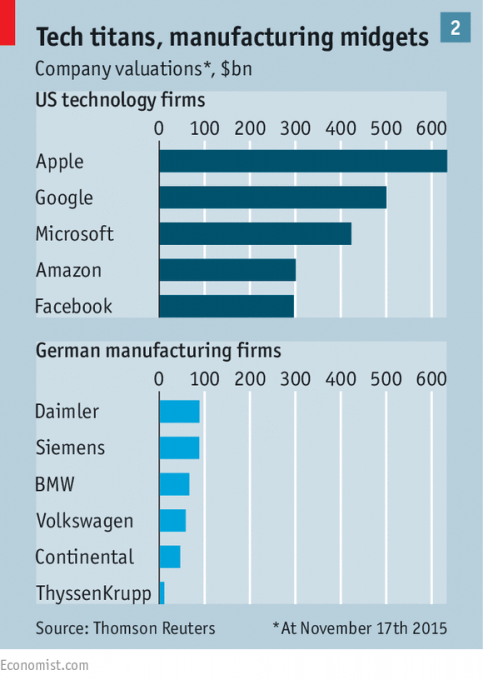 Large companies like Daimler will need to implement completely new structures and know-how in order to prevent getting dependent on the US tech giants. This means for example to develop own OS for car infotainment systems in order to be in charge of the collected data. Moving to flexible production models will be even more challenging for SMEs. The reason is that they will need to invest in new equipment like robots and 3D printers and in addition into new fields like IT in order to create service/e-commerce platforms. In order to stay competitive SMEs need to do two things. Firstly they will have to identify their core competences and invest in them. Secondly they will need to find new partners and integrate themselves into clever supply chains which can even include collaborations with companies in same industry sectors. Regarding access to skilled personnel German and European companies are embedded in a completely different legal framework than companies in the US and China. We will need to find strategies that allow us to keep existing workforces in place while getting access to new potential. This can only be achieved through growth and expansion beyond European borders. The data security situation is similar. Privacy laws are stricter in Europe and Germany than in most other countries. Therefore European companies need to invest more time and effort in the design and implementation of security technology. However as hacks tend to make headlines and seem to create more and more awareness for the topic among consumers companies from other parts of the world could be forced to implement similar advanced security technology. This might equalise the disadvantage for European companies. Finally it is worth mentioning that we will need to invest more in the development of advanced technologies like robotics, AI and 3D printing. If we can secure a top spot among suppliers of technology necessary for new, flexible production models we will create value in the future. Who knows maybe “Made by German Robots” becomes the new “Made in Germany”.